it’s important to add an acid element after the sugar has been incorporated. I use vinegar, but lemon juice could be used instead. It helps ensure a crisp outer crust and a soft, chewy centre. Preheat the oven to 120°C/250°F/gas mark 1⁄2. Line a baking sheet with nonstick baking (parchment) paper. Put the egg whites into a spotlessly clean bowl and whisk on full speed until they form stiff peaks. Reduce the speed of the mixer and add the sugar a little at a time, beating thoroughly. When all the sugar has been incorporated, add the cornflour and vinegar and whisk again on high speed until the mixture is glossy and stays put when the bowl is turned upside down. Fold in the vanilla extract to flavour the meringue, then spoon the mixture into a piping (pastry) bag fitted with a 1cm (1⁄2 inch) star nozzle (tip). Pipe 24–30 walnut-sized blobs of meringue on to the prepared baking sheet, making sure they do not touch one another. Bake for 25–30 minutes, until firm to the touch but still soft in the middle. I normally leave mine to cool in the oven with the door ajar. Carefully lift the meringues off the paper and sandwich them together with some whipped cream and berries. Serve within a few hours of making, dusted with icing sugar (if using). 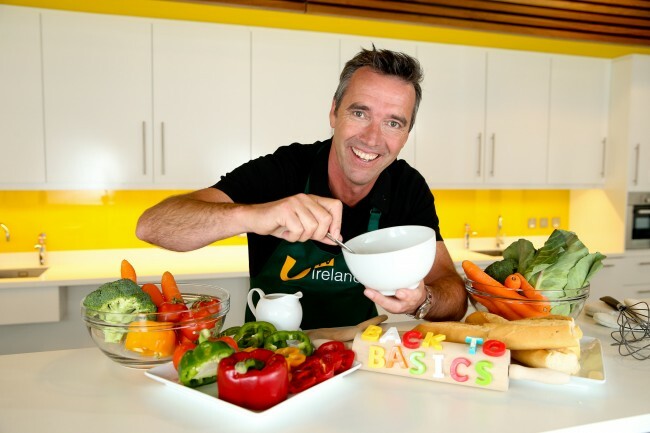 Kevin Dundon’s “Back to Basics”, is a new eight part series presented by award-winning chef Kevin Dundon, exlcusive to UTV Ireland at 8pm on Friday evenings. The show helps home cooks master basic cooking techniques – from poaching eggs and tackling a soufflé to whipping up a quick supper or a big Sunday lunch for friends and family. UTV Ireland is available on Sky channel 116, Saorview channel 6, UPC channel 110 and eVision channel 108. UTV Ireland also offers a catch-up service on www.utv.ie and on the UTV Player, available to download on smart devices.